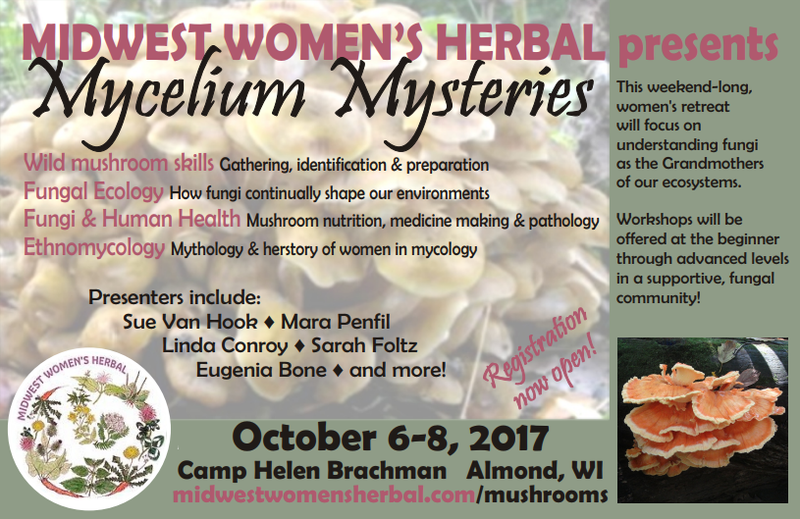 Join Lauren Cahillane with Midwest Women's Herbal as she discusses their upcoming fall event Mycelium Mysteries: A Women's Mushroom Retreat. This event looks just FANTASTIC! This weekend-long, women's retreat will focus on understanding fungi as the Grandmothers of our ecosystems. Workshops will be offered at the beginner through advanced levels, and include topics in wild mushroom skills, fungal ecology, fungi and human health, and ethnomycology. This is a place to share knowledge and get comfortable with using our mycological skills in a supportive, fungal community! Check out THE PRESENTERS HERE. Fungal HERstory - explore with us the connections between the feminine and the fungal, in mythology and in science, from cultures all around the world. ~ with Alanna Burns & Mara Fae Penfil. Thanks to Lauren and Midwest Women's Herbal for taking the time to share this wonderful event that they are hosting! I hope y'all are able to make it.